It's IHCC's first Potluck Week for 2018. I've made Rum and Raisin Cake from the cookbook Sweet by Yotam Ottolenghi and Helen Goh. Ever since I bought the book, this is the recipe I've been wanting to make, I love cakes with rum, and this cake did not disappoint. The only change I've made is to reduce the brown sugar slightly and omitted the glaze, as I prefer eating cakes without any glaze or frosting. As long as the cake is moist, buttery and delicious, the glaze or any frosting would not be missed, at least for me. The raisins needed to be soaked in rum the day before. The batter is really thick, thicker than most bundt cakes I've made, and that got me worried that the cake would be heavily densed. I was tempted to add a few tablespoons of milk, but decided to follow the recipe instead. The filled bundt pan with the batter was a weight! During baking, the cake almost did not rise at all, the level of the batter when filled into the pan was almost exactly that as when the cake was done baking. It smells incredibly rum-delicious when the cake was baking. 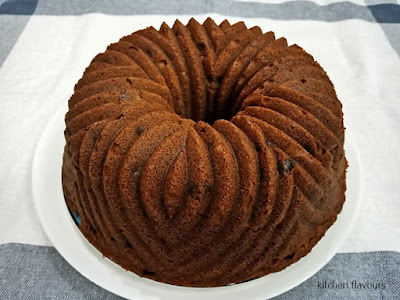 When the cake has cooled for 15 minutes, I turned the cake out of the bundt pan, and that was when I knew that the cake would be OK, as it was quite soft and tender to the touch. 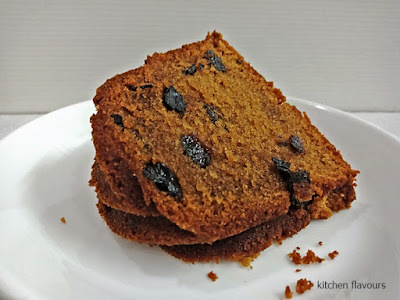 This cake smells incredibly fragrant from the rum, with moist, surprisingly soft tender crumbs, maybe due to the sour cream used for the batter, and not only it is rum-fragrant, you can taste the rum too, a definite plus in my books, delicious! I really like this cake, and would love to make a yellow version of it by replacing the raisins with sultanas and using white sugar instead of brown. Recipe can be found from guardian.com here, or from Sweet , page 124. 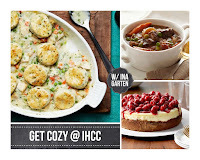 "Get Cozy" is the theme for this week at I Heart Cooking Clubs. "This time of year it's nice to snuggle up on the sofa, GET COZY with something yummy to eat and bingewatch the next Netflix hit" Well, I would love to snuggle up on the sofa, get cozy with something yummy and browsing thru a couple of my cookbooks! I am not a TV person, but I would browse through my cookbooks every night. Ina Garten's Mexican Hot Chocolate is very good, easy and quick to make. Milk and a tablespoon of brown sugar is simmered, then remove from heat, and whisk in chopped bittersweet chocolate, vanilla extract, ground cinnamon and a pinch of ground cayenne pepper. Let sit for a few minutes, then reheated until the mixture comes to almost a simmer. Serve immediately with a cinnamon stick as a stirrer. Ina has included a recipe for Cinnamon Baked Doughnuts for dipping into the hot chocolate, but I have omitted that. All I need after a busy day when I was looking forward to relax with a couple of my cookbooks for company, is just a cup of comfy beverage, and Ina's Mexican Hot Chocolate does just that! We love this! It is very chocolaty, "cinnamony-fragrant", with a slight spicy kick of the cayenne powder. This is the first time I'm using cayenne powder in a chocolate drink, and it definitely would not be the last time. Very yummy indeed! 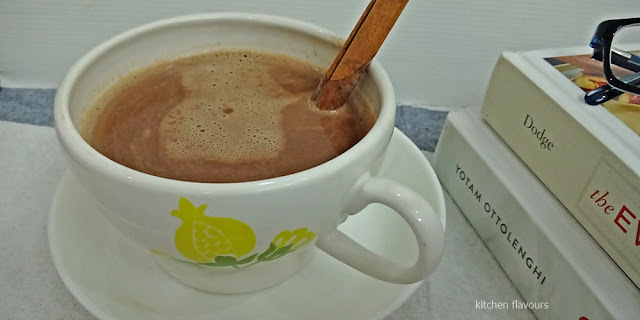 Both my son and daughter are already asking me to make this hot chocolate drink again! Place the milk and brown sugar in a medium saucepan and bring just to a simmer. Off the heat, whisk in the chocolate, vanilla, cinnamon, and cayenne pepper. Allow to steep for 3 minutes. Reheat the mixture over low heat until it almost comes to a simmer. Pour into mugs, add cinnamon stirrers, if using, and serve with cinnamon doughnuts for dipping. 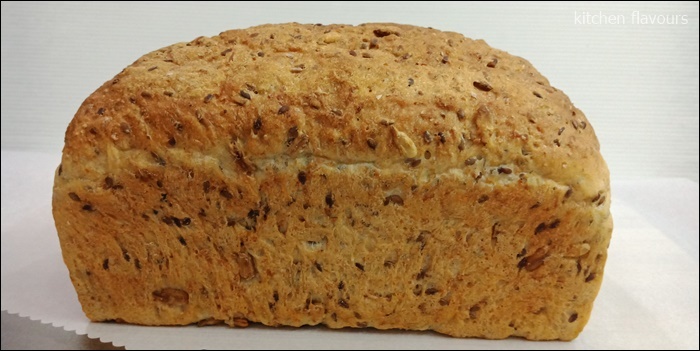 A wholesome healthy loaf of bread, with oats, sunflower seeds, flax seeds, honey and both wholemeal flour and white bread flour. Another wonderful bread recipe from master baker, Dan Lepard. I like his method of "kneading" the dough, the fold and push method, repeated at 15 minute intervals, a few times. A few hours of advance planning is required, as the sponge is made at least 2 to 4 hours before the final dough is mixed. The sponge is made by mixing together, warm water, instant yeast and strong white flour, and left for at least 2-4 hours or even overnight. I left mine for close to 4 hours before mixing it with the rest of the dough ingredients. The porridge is made by mixing together, rolled oats, honey, flaxseed, sunflower seeds, and boiling water, then left to cool to room temperature. The dough is mixed by hand and it will be very sticky. But the stickiness will be reduced after three intervals of fold and push method. The recipe has the top sprinkled with some flour and then slashed along the length. I have omitted both the flour and the slashing. The bread is baked in a preheated oven at 230C for the first 20 minutes, then reduce the temperature to 200C and bake for another 20-25 minutes. The top is browning by the end of the first 20 minutes, so I have tent the top with foil. 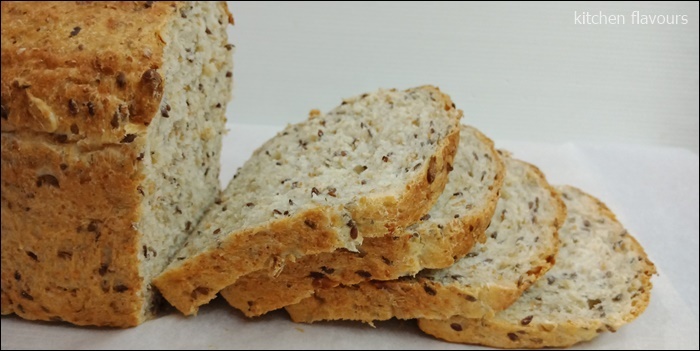 Bread is moist with soft chewy crumbs, with a touch of sweetness from the honey and added texture from the wholesome seeds. Lovely toasted and spread with cold salty butter and my favourite jam, with a mug of hot coffee, for breakfast. The recipe can be found in Dan Lepard's book, Short & Sweet, page 39, or from The Guardian, here. 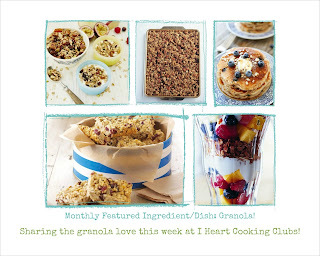 It's Granola week at I Heart Cooking Clubs (IHCC). The theme for this week, Monthly Featured Ingredient/Dish : Granola! We are free to make any granola we like and feature it in any way we want. 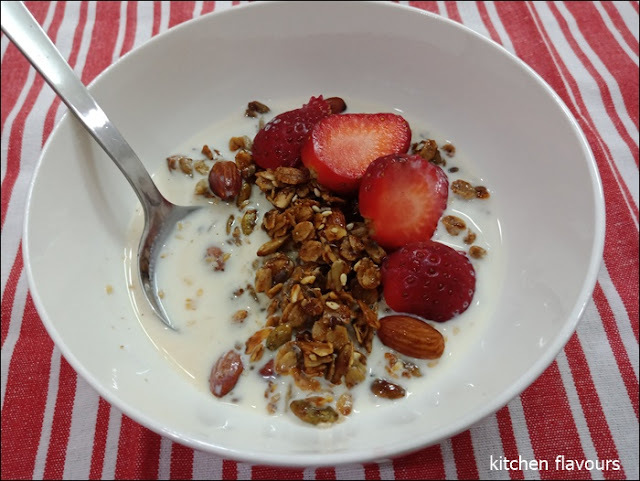 I love granola and have seen a recipe from Nigella Lawson which I've been wanting to try ever since I bought her book, Simply Nigella. Granola is very easy to make at home. Nigella's recipe uses olive oil, maple syrup, almonds both whole and sliced, brown flax seeds, sesame seeds, pumpkin seeds, sunflower seeds, rolled oats with ground ginger and ground cinnamon. I did not have any maple syrup, so I have used an equal amount of honey. Mix the ingredients together as per the instructions given, Nigella uses her hands to mix (using disposable vinyl gloves), but I've used a sturdy spatula which did a good job of mixing too. 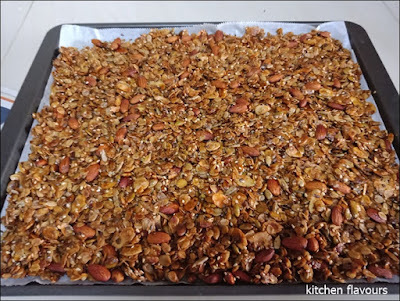 Bake for one hour at 300F, turning the granola over after 30 minutes of baking time, so that they bake evenly. Continue to bake until the granola is a deep rich brown. Let pan cool on wire rack. Recipe makes quite a lot! This is very good! Very crunchy and not too sweet. Love it! Granola is one of my favourite snack to enjoy anytime of the day. 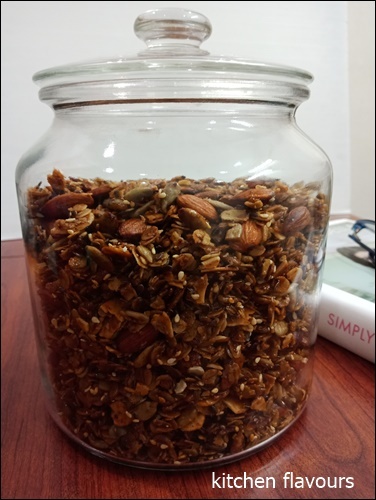 My favourite way to eat granola is to enjoy it by the spoonfuls! The jar above, is the amount of the full recipe. By the next day, half has already gone. I'll be adding some dried fruits to my bowl, as I love having bites of dried fruits in granola, my favourite dried fruits are golden raisins, apricots and cranberries. And for the nuts, definitely almonds for granola. Enjoyed it for breakfast with milk and slices of strawberries. A great start to a busy day! Yum! Preheat the oven to 300F and line your baking sheet with parchment paper. Tip the oats into a large bowl, add the spices and salt, and mix well. Now add all the nuts and seeds, and mix well again. In a measuring cup, combine the oil and maple syrup, then pour the mixture into the oat, nuts, and seeds and, with either a fork, or hands encased in disposable vinyl gloves, mix to combine. Tip onto the prepared baking sheet, and move it around so that it covers the pan evenly. Put in the oven to toast gently for 30 minutes and then, with spoons or spatula, turn it to help toast the underside as well. Put back in the oven for another 30 minutes, and then sit the pan on a wire rack until the granola's cold. Store in a sealed jar or an airtight container for up to 1 month. 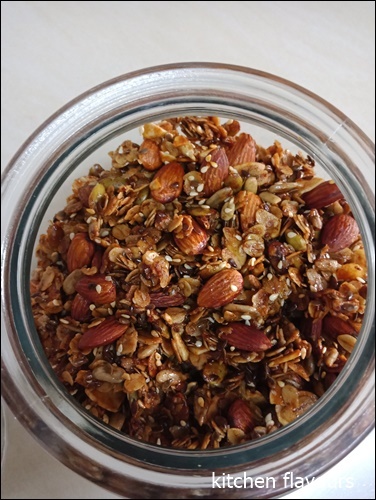 Monthly Featured Ingredient/Dish : Granola! 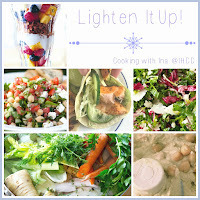 This week, Lighten It Up! is the theme at I Heart Cooking Clubs (IHCC). 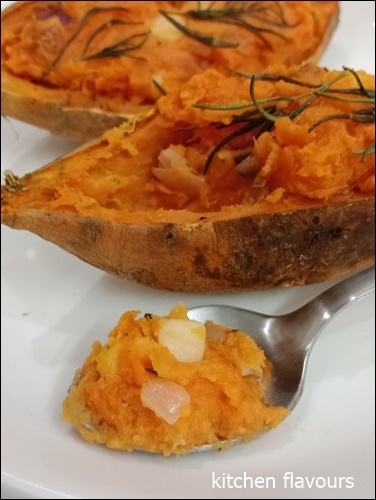 I've made Ina Garten's, Twice-Baked Sweet Potatoes, and it was really yummy! It is really easy to make, and the result is delicious. I did make some substitutions to the recipe with ingredients I already have. Recipe uses taleggio cheese, but I did not have any, and I don't think I have seen it before. So I've used what I had, mozzarella cheese. And instead of thyme, I've used rosemary from the garden pot. To lighten it up, I cut down on the salt and butter, which I always do anyway. Ina uses a lot of butter, and salt in most of her recipes. I've used about 2-1/2 tablespoons of butter in total ; about half tablespoon to saute the chopped onions and 2 tablespoons to mix into the sweet potato mixture. As for the salt, use the amount to taste. I've baked 4 sweet potatoes, which took about 70 minutes until tender, as those sweet potatoes were rather plump. Depending on the size and thickness of the sweet potatoes, it may take a shorter or longer time than that. 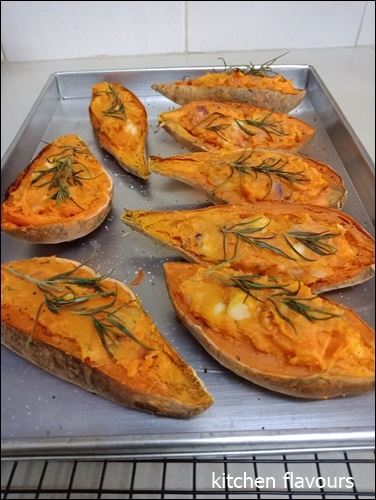 Cut each sweet baked potato into half lengthwise and scoop the flesh out, leaving a 1/2-inch border all around., with shells shaped like a canoe. Place the potato flesh into a bowl, mash it with a fork, and mix in an egg, salt and pepper and the cooled sauteed chopped shallots (sauteed earlier in butter, and chopped fresh rosemary). 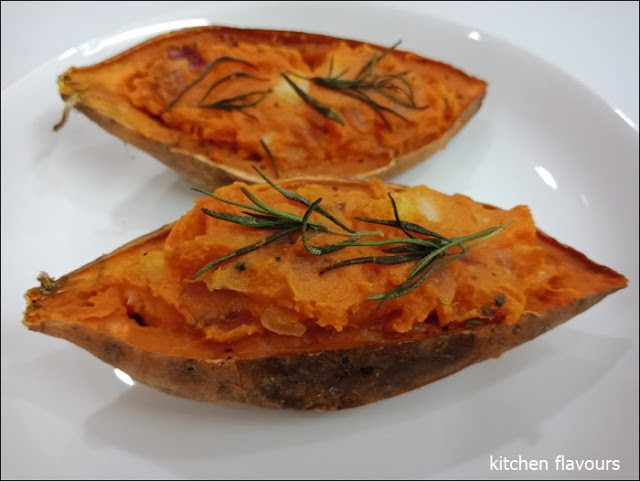 Fill the sweet potato shells with this mixture, top with a sprig of rosemary (or thyme) and bake for 20-30 minutes until puff and lightly browned. It smells wonderful with rosemary while baking. This is delicious. It is easy and quick to prepare, though some time is needed when roasting the whole sweet potatoes until tender. After that it comes together pretty quick, in half an hour's time, you will have sweet and savoury sweet potato boats to enjoy! These are good eaten warm, and when it gets cold, simply reheat them in the oven for about 7 to 8 minutes until warm. Actually they are just as tasty at room temperature. There's already a request to make this again. Place the potatoes on the prepared sheet pan and cut a few slits in each potato to allow steam to escape. Bake the potatoes for 50 minutes to 1 hour, until very tender when tested with a skewer. Set aside for 10 minutes, until cool enough to handle. Meanwhile, heat 1½ tablespoons of the butter in a small skillet over medium heat. Add the shallots and sauté for 4 to 5 minutes, until tender. Add the thyme and cook for 1 minute. Set aside. Cut the potatoes in half lengthwise and carefully scoop out some of the warm potato into a medium bowl with a teaspoon, leaving a ½-inch-thick shell of sweet potato. The potatoes should look like little canoes. Sprinkle the potato shells generously with salt and pepper. Add the remaining 4 tablespoons of butter to the scooped-out potato flesh and mash it with a fork. Add the egg, shallots, Taleggio, ¾ teaspoon salt, and ¼ teaspoon pepper and stir until combined. Spoon the mixture into the sweet potato shells and top each with a sprig of fresh thyme. Bake for 20 to 30 minutes, until puffed and lightly browned. Serve hot.